The new small business development department (SBDD) has transferred from the department of trade and industry (DTI) the R1bn fund which covers both corporate incentives to develop small business and the Small Enterprise Finance Agency (SEFA). However, it will leave with DTI all matters relating to B-BBEE insofar as regulations are concerned. Both the new minister, Lindiwe Zulu, and deputy minister, Elizabeth Thabethe, were present for a short departmental briefing by SBDD given to the new small business portfolio committee chaired by Ruth Bengu, who in the last parliamentary period served as chair of the transport committee. In an earlier portfolio committee meeting of trade and industry, a few days before under their chair, experienced ANC member Joan Fubbs, DTI had called for a rethink on small business policy. They said they wanted to see a clearer policy on the SMME support role by national government with provincial and local government and to establish a programme for rolling out more small business “incubators”- something that opposition parties had been calling for over a long period of time. Also DTI supported the call to review the small claims court system so that access to affordable justice was more affordable. They wanted this to be a further target of the new department. Such recommendations came amidst a foray of criticism by commentators that the new department could become a diversion for unsolvable small business issues or alternatively the new department could become merely a point for start-up small business without any real muscle. The new department in addressing MPs confirmed to them that its mandate was to focus on “enhanced business support” and they emphasised their support for women, people with disabilities and to provide mechanisms to access finance, business skills development. They also said they were there to ease regulatory conditions; to help regulate better the SMME environment and to give leverage on public procurement. It was important to recognise, SBDD said, that it was also there to encourage the development of cooperative entities, in which instance shareholders themselves were the members and entrepreneurs. Finally, the process of creating market access was an important task, they added. Nothing was new here. But opposition ears pricked up when they said tax relief grants to corporates that invested in small business development were to be considered and incubation programmes and technology upliftment were priorities. The immediate future, however, was all about configuring the new department; the “migration” of responsibilities from DTI; and transferring allocations for the establishment of support institutions. Chair of the committee, Ruth Bhengu – previously chair of the parliamentary transport committee – then called for response from opposition members which mainly came from Toby Chance of the DA, whose questions were answered by both by the new minister and deputy minister. Chance said that whilst applauding the formation of this department, he wanted to know whether or not any success was to be measured in terms of jobs created, which to him was the bottom line, he said. Also he wanted a clearer definition of what government actually meant by the term “small business”. He said there were plenty of “gleaming new supermarkets in our townships but very little industrial developments, in fact some industrial parks were in a state of decay.” Chance said the DA was also worried that the impact of new labour legislation and labour regulations was immobilising small business and the amount of red tape currently being experienced was becoming “out of hand”. Chance said he hoped the new department recognised the fact that that corporates and industry should focus on the development of small businesses to create the job growth called for by the NDP. Partnerships with small business were the best way of achieving this, he noted. He concluded that all “tax incentives should be re-visited” and that more emphasis should be laid on small manufacturing businesses. In reply, minister Lindiwe Zulu agreed on the issue of red tape as a hindrance to small business and said her objective was to become like Rwanda where direct contact with national bodies that supported initiatives was far easier. However, she said that business had to understand that it had a role to play and a “culture of compliance” had to be encouraged in both small and large business and manufacturers or there would be anarchy. Also large businesses and the state will have pay small business invoices on thirty days or risk penalties. Chance replied that the governing party seemed to have “developed a track record of “attacking business persons when they criticised ANC economic policies or asked tough questions”, which statement prompted vehement denials from the minister and deputy minister. Major learning curve for new MPs…. Probably the most difficult parliamentary rule to explain to the new influx of MPs who have become members of the fifth Parliament is the time honoured and important fact that whilst they may debate and even disagree with various facets of the budget vote appropriations now passed by Parliament, they could not change the sums involved. That is because the Appropriations Bill, which passes the money raised by taxes and from banks to the various government entities, is a money Bill. All such money Bills emanate from national treasury and are tabled by the minister of finance. In terms of section 77 of the Constitution, such are Bills that Parliament cannot alter by amendment, whereas with all other Bills they can exercise by majority vote any changes. 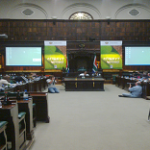 The majority of proposed legislation that comes before Parliament is in the form of a Section 75 Bill, legislation that will make its way to the National Assembly (NA) for a final vote, the “concurrence” of the National Council of Provinces (NCOP) only being sought during its parliamentary passage. These can be altered by Parliament and Parliament usually holds its own public hearings on such Bills. The remaining but small balance of Bills, which are quite often of greater importance and interest to the general public, are “tagged” as section 76 Bills. This is because they affect provincial and local administration and constitutionally must go before each provincial legislature to obtain a simple majority for amendment, rejection or approval from the nine provinces. Public hearings occur right down the line accordingly. Hence, the argument over the Mineral and Petroleum Resources Development Amendment Bill and the e-tolling issue, both of which have both described by opposition members as Bills passed unconstitutionally because, in their view, the subject matter was not purely “national” but involved provincial legislation, taxes and provincial citizens. In other words, they maintain the Bills were incorrectly “tagged” as Section 75. But back to the very different section 77 money Bills which are introduced direct to the NA by the minister of finance. Why, ask new MPs, should we sit debating the budget vote in portfolio committees when we cannot change the Bill? The reason goes to the whole root of the parliamentary process and why the Appropriations Bill, as the first Bill that a new crop of MPs has to deal with, forms the basis in the learning curve of why they are there at all. This is because this is where the process of financial oversight starts. When the budget vote comes before Parliament, each department, headed by the minister involved, also comes before the relevant portfolio committee and explains what they will be doing with their allocation of the total budget for the current year, their objectives and targets. This commitment is accompanied by a five year strategy plan for the particular department. The annual cycle of accountability has therefore started and this is why it is so important that director-general posts are substantiated and not filled by those “acting”. These processes are explained to MPs during their training of two weeks now completed. Following the budget presentations by each government department to each portfolio committee in the NA (and select committee in the NCOP), the Appropriations Bill then goes to a joint sitting in the NA, all MPs from both Houses being present and each minister, with a speech on intent, targets (with, hopefully, some indication of any legislation that ministry intends tabling) the budget vote is then proposed in the knowledge that it will indeed be passed. Numbers, targets and objectives have therefore all been vocalised and minuted as a result and now the financial facts and objectives are “set in concrete” with all present. Failure or success can be measured. As a matter of fact, this process is usually the first interface between a new MP and the government department to which the MP has been allocated, which is also an important part of the democratic and oversight process. In the case of the budget vote it is, in essence, for most MPs a financial initiation. By coming before the committee, consequently, the director general of each department is also committed both on policy and in monetary terms. Each cabinet minister is subsequently asked to sign a presidential delivery contract which, in public service terms, is followed up upon by the department of performance, monitoring and evaluation – part of the Presidency. However, none of this is so important as the parliamentary monitoring process itself, which both enables all political parties to “grill” under performing departments during the year; debate legislation supporting policy and also, importantly, to provide a transparent window during the oversight process to both media and monitors, who exercise their constitutional right to observe such meetings but with no speaking role. Other money Bills involve taxation matters, which are specifically dealt with by the portfolio committee on finance, and a special report submitted to the NA. An example of this would be the budget proposals in April. It is this long and somewhat complicated process that protects us all – emanating from one of the better constitutions in the world. And long may we be so protected. Political comment is not in the vocabulary of monitors such as Hof, but curiosity as to the background and qualification for national debate of some of those on the party lists to become parliamentarians is inevitable. We wait with bated breath to see what the “new crop” comprises and the background of those nominated as chairpersons of the 54 odd NA and NCOP portfolio and select committees, based on the percentage of a presumed ANC win. Also, bearing in mind that the National Chairperson of the ANC, Baleka Mbete, has talked of a shrinking cabinet and the abandonment of certain government departments with possibly a new department for small and medium business, changes in due course will occur in parallel with parliamentary committee structures. Nobody would know better than Mbete, as a past Deputy President and previously Speaker of the National Assembly, that changes at ministerial level means changes in Parliament. Perhaps all of this might wait for ANC conference in a few months, where our curiosity is again provoked as to the future of President Jacob Zuma. We will admit that we assumed that when Parliament was closed we would have little to monitor or report on, other than the Nkandla debate for which a number of parliamentarians were recalled. However, a paucity of subject matter is far from the case….. the various departments having taken the opportunity to finalise a number of policy documents affecting business and industry. An example of this is the publishing of the paper on carbon tax offsets and Minister Davies’ next IPAP plan, all this being in the light of the fact that some of the ministers, who may be leaving, wish to bring to finality their objectives during their five year tenure. Rumours abound as to which ministers will be staying and which will be going but our report this week is as much on retrospective proposed legislation that has stayed as an “in-tray” task for the new, fifth government of South Africa, as well as commenting on future policy changes. This is not forgetting that government departmental targets for public servants will remain, regardless of election results. These are interesting times in our country, bearing in mind a slow recovery in the Western economy and pressure on South Africa to get its infrastructure build programme underway.